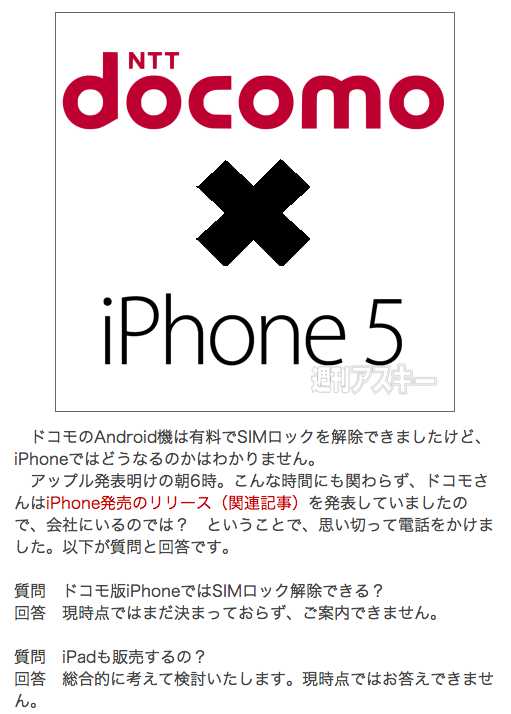 So there IS going to be a Docomo iPhone then... Starting from next Friday! If Docomo would indeed not unlock the iPhone 5S, it would be interesting to know whether they allowed unlocked iPhones 5S handsets on their network or again filter IMEIs to force customers to buy (locked) handsets. They're stuck. As far as I see it, they have no choice but to unlock or look really bad in the eyes of consumers and the Ministry of Infrastructure and Communications. Xi SIMs and the mopera.net APN is used for existing contracts, so they can't start filtering that. sp-mode APN is already filtered. The only reasons they could give for not unlocking would be to 1) blame apple or 2) say the customizations to the firmware to allow sp-mode to work renders the phone unusable with any other carrier. And, while I haven't always responded, I think the idea that Japanese people don't even know what a SIM card is is about 5 years out of date. I thought Docomo is somehow preventing the use of unlocked iPhone 5 (not 5S) handsets on their LTE network. Is this still the case? If so, how are they doing this? If they don't do IMEI filtering, the carrier profile might be the only way to do this. Correct me if I am wrong. Yes, that is incorrect as I understand it, which is that it's a problem on the phone. I haven't followed it much, but it seems as through there was a plist with an deny all, then allow specific LTE carriers, ostensibly to save battery by not searching for LTE on carriers that don't have it. I could be wrong about the plist settings. There is no IMEI filtering if you ISP is mopera, and this is the ISP that all non-DCM branded phones use. Just 3 hours after the leak, The Nikkei ran a story containing a "leak" online: according to the paper, iPads could join the Docomo lineup "later in the fall". The Nikkei also says that in order to appeal to corporate users, Docomo thinks about bundling the iPhone and iPad at a lower price. Half the reason I'd want to get the 5S on Docomo is for the unlock. Massive double standards if they don't unlock it now after an unequivocal statement like the one above! In fact that, might actually enough for me to vote with my feet and wander over to SoftBank. Why is there a big, black batsu in the promotional docomo iPhone poster? When I first glimpsed it, I thought it was an attack on one or them both. Is that an official poster? Maybe its a "multiply" sign. You know, like 5 x 5 = 25. Still doesn't make too much sense though. Ask ascii shukan. They made that - it's not official from docomo.